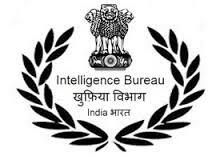 Intelligence Bureau invites applications for the post of 320 Junior Intelligence Officer in the Intelligence Bureau, (Ministry of Home Affairs), Government of India. Apply Online before 24 September 2016. I might be ready to claim that you have a completed a high-great job here to share that article with us. You may have observed it after some study and therefore obviously in any admire that it will aid us all. I am here to appear for some information on the subject of considered one among my resume writing service . I'm hoping it helps me to get encouraged and determined an answer for my hassle soon.